I’ve been recording with MS since I started in this industry, about 12 years ago now. There are of course many other recording techniques available, and I own microphones suited to most of them. I tried to elaborate a tiny bit on some of the other stereo techniques in my previous article, and that’s when I realized that MS really needed it’s own article. Of all the stereo formats I record in, MS is my favorite. I find it to be the most compact, and by far the most versatile, of all the stereo recording techniques I know. It’s also a bit tricky to wrap your head around the first time you try to understand it. I remember at USC the day I asked Tom Holman, creator of THX, to explain something about MS that had been puzzling me (probably the entire idea behind it and how it worked at all). For the next hour or so, he proceeded to draw math equations on the dry-erase board. I sat, staring and dazed, occasionally nodding to feign understanding. The fact is, MS is a strange recording method. I’ve had quite a few people, even ones I work with, tell me they don’t like MS, but many times it seems to me that they can’t tell me why. Maybe it’s simply that it’s a bit too much like voodoo. But properly done, MS recording is basically another form of XY recording. David Farmer and I, while both in New Zealand, did some tests between his Schoeps XY microphone, and my MS rig. Neither of us could hear much difference, and my memory is that both of us slightly preferred the MS rig when we felt we could hear any differences. There is really nothing to be afraid of with MS.
For those who don’t know, an MS rig consists of two microphones (or more, as there is a Schoeps Double-MS setup and I’ve personally set up and tried a Triple-MS rig of my own Frankensteinian devising). In the stereo version, there is a Mid microphone, and a Side microphone, hence the name MS Recording, or Mid-Side Recording. The mid microphone faces forward, and can be of any pickup pattern, although almost always a cardiod or hyper-cardiod microphone is used. The side mic is always a Figure-8, or bi-directional microphone, whose polar pattern is perpendicular to the front facing microphone. The two microphones are ideally very well matched, and most of us use mid microphones that have in their family a Figure-8 version as well, for instance the Schoeps MK series of capsules, the Sennheiser MKH series, or the Neumann KM100 series with AK capsules. 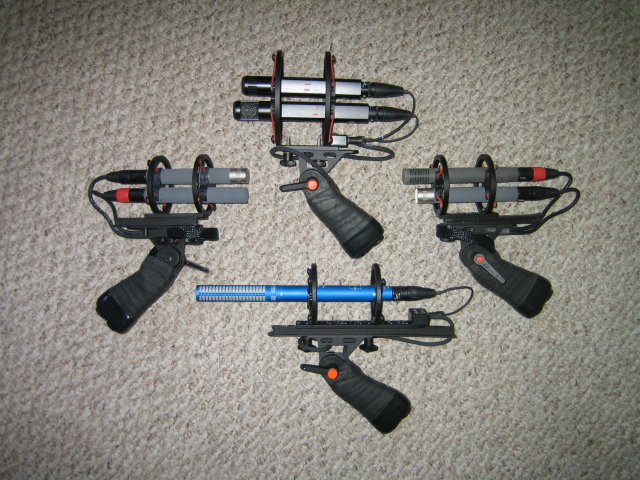 All of these have cardiod, hyper-cardiod and Figure-8 mics available and are ideal to use in an MS setup. There are also self contained MS microphones, made by companies like Pearl and Sanken, or the Neumann RSM-191, which I know several people here use. The only reason I tend not to like microphones like the RSM-191 is that they use external powering and matrixing boxes, which I find cumbersome. But the RSM-191, the Sanken CMS-7 are very nice sounding MS microphones as well. You can see pictures of my two MS rigs in the previous article on microphones. My rigs consist of separate microphones in an MS array, rather than a single MS microphone. In my case my first MS rig consists of a Schoeps CMC6XT / MK41 hyper-cardiod mid microphone, with a CMC6XT / MK8 side microphone. My second rig consists of a Sennheiser MKH50 hyper-cardiod mid mic, and an MKH30 Figure-8 mic. So how exactly does MS work? Basically through some summing and phase manipulation, you can derive from the two channels, a stereo image, which will sound about the same as an XY rig aimed somewhere between 60 and 120 degrees apart. Rather than explain too much how exactly it works, I’ll simply link an article on WikiRecording that explains it better than I could. So why record in MS instead of XY, ORTF or any other method? I’ll list some of the advantages, but first I’ll admit there are a couple of disadvantages. Let’s get them out of the way first. The first major disadvantage to recording in this format is that MS Recording requires processing after the sounds have been recorded. This is because what you are actually recording is a forward facing microphone, and a side facing microphone, or two mono channels. Only though some summing and phase manipulation can you turn this into a stereo recording. Many recorders now have the ability to do this during the recording process, and many single MS microphones can do this internally or through the use of an external box (like the Neumann RSM-191), but most of us who use MS prefer to process the sounds in ProTools. The Sound Devices 722 that I use actually has a brilliant feature to decode MS only to the headphones, allowing me to record the raw channels, but hear the decoded stereo channels. I prefer to record MS as the raw mono channels, load the files into ProTools, and master them into stereo files. Processing consists of either using a plugin such as Waves S1 Imager (there are others) or else building a set of tracks to do the MS Decoding. If people here are really interested, I’m happy to write another article explaining more the details of building MS mastering tracks in ProTools. Just make some comments here if you want that kind of thing. The second disadvantage is that if you decide not to master the MS recording into usable stereo, and store it as an MS file, and forget, you might have problems later. This is because the two channels of an MS recording won’t sum nicely together into mono. In fact the phase will be all over the place. If later you forget that a file in your library is MS, and you use it as stereo, you might not actually catch it just by listening to it. I’ve found that even raw MS files can dupe your ears into thinking it’s stereo. But later, especially in a film environment, in a mix for example, those channels maybe get summed together, and result in a very strange phasey sound. But now for the advantages, and this is where it gets fun, and why I’d really encourage that your first rig or main rig be an MS Rig. First, for a stereo recording rig, the MS system can be quite compact, compared to say XY, ORTF, Spaced Omnis, etc. Because the two microphones are placed one above the other, it’s quite easy to fit an MS Rig into a single Rycote zeppelin, even one designed for a mono microphone. In the pictures in the previous article, you can see that in practice, the smaller rigs are Schoeps rigs in mono Rycote suspensions. Unless you’re building a miniature XY set, or using a compact XY microphone, MS is going to provide you with the most compact rig. Secondly, in an MS rig, you always have a forward facing mono microphone, and for a lot of general effects work, this is incredibly helpful. I mentioned in the previous article the usefulness of a short or medium length shotgun mic, like the Sennheiser 416. While this is true, most of the time, I’m perfectly content to use the hyper-cardiod mic in my MS rig as my mono effects microphone. The MK41 Schoeps, and the MKH50 Sennheiser in my MS rigs are not as directional as the 416. But they are actually close. Close enough for a lot of what I want to record. I’ve built some cables to connect my stereo rig in the Rycote to just one input on my 722, so I can easily use my stereo rig as a mono rig, the cable simply dropping the figure 8 channel out of the way. Third, MS allows for post processing of the stereo image width after the recording. This can be quite useful. This is done by varying the amount of the side microphone signal against the amount of the mid microphone during processing. Pull the side microphone out completely, and you’re left with only the forward facing microphone going to both channels. Adding the signal from the side microphone back in adds width to the stereo image. This is over simplified, but the advantage of MS is that you can vary the width of your stereo image. Fourth, a small one, but because the microphones in an MS rig are coherent (the capsules aligned vertically), stereo files derived from an MS recording are fully mono compatible, which can still be important in the film sound business. XY recordings are mono compatible too, but other methods like ORTF or Spaced Omni recordings may not be. Fifth. OK, I’m going to reveal one of my best kept secrets. Quite some time ago, I realized something. If you’re recording in MS, you’re not recording in stereo. You are in fact recording in LCR. Think about it this way. If you recording a forward facing microphone and a side microphone, and then use them to create two stereo channels which behave like XY recording, then what happens if you add back in the raw mic microphone? Think of the screen channels across the front. Decoding the MS files into stereo give you the Left and Right. The mono forward facing microphone can give you the back the Center. I now master most all of my MS recordings into LCR instead of stereo. Again I’m happy to build a walkthrough on how to do this in ProTools. It’s not complicated, but there are a couple of pitfalls to be avoided. But I’ve found it incredibly useful. First, LCR recordings are very useful in film. I’ll give you an example. When recording backgrounds, say you record something in stereo. Now you take that material to the mix stage. One thing that mixers tend to do, is to pan in the stereo channel to get some bleed into the center channel. They do this because they need help masking the natural background of the dialog. But this results in your nice wide stereo background now being panned into something less wide. If you instead have a natural LCR file, there is no need to pan in the sides, instead, the mixer will have a natural center channel to be brought up to fill in the center channel. I find LCR backgrounds sound incredibly natural. Things panning across now pan from Left, to Center, to Right, for instance, and the sound image for film use is very smooth and very natural. Crowds sound brilliant in LCR, as do city backgrounds, just about anything really. Just as stereo is a huge improvement over mono, I feel like LCR is a big improvement over stereo. The other great thing about mastering your MS recordings into LCR is that you are then preserving that forward mono facing microphone. Need a mono version of the effect? You already have it, just use the center channel by itself. When mastering into LCR, you will be placing the raw forward facing mic as the center channel. Need a stereo version, no problem, just drop the center channel of the LCR and you’ll have the normal XY version of the sound. So what you are preserving is a mono, stereo, and LCR version all in the same file. Later versions of Sound Miner will supposedly allow you to just select the left and right channels of an LCR effect for spotting right to a stereo track in ProTools. This will be very useful. For now, I tend to spot to an LCR track, and from there, drag it down into three mono tracks, to allow me to work with the LCR file. It’s cumbersome, but still useful enough to me to make it worth doing. And if I haven’t confuzzled you enough (for the definition of confuzzled please see the brilliant stop-motion film Mary and Max), here is where it gets really interesting. Imagine an XY rig, consisting of two microphones, the forward facing mono mic, and a Figure-8 microphone. Now, imagine we simply add in another mono microphone, but this time, facing backwards, in the opposite direction to the forward facing microphone. By adding in only one more microphone, we have actually now created another MS pair. This is because the side microphone will also still be facing perpendicular to the newly placed ‘rear’ microphone. It only requires the phase to be flipped the opposite way, and it will work to create backwards facing channels. Schoeps actually makes a microphone doing exactly this. It’s very expensive, but with only three channels, you can derive a quad recording. But wait, if I told you earlier that recording MS is really recording potential LCR, then a Double-MS rig must be recording Double-LCR, or the ‘potential’ for them. A Double-MS rig can actually be decoded into Left, Center, Front, Left Rear, Center Rear, and Right Rear. Six channels can be derived from just three recording channels. This is very easy to do, once you’ve built a template in ProTools to do it. True Center, Left Front, Center Front, Right Front, Left Rear, Center Rear, Right Rear, Left Side, Right Side and LFE. I am the first to admit that this is silly and fairly useless. But it does indeed work. I set up a Triple-MS rig with the Schoeps, recorded some city sounds, and mastered them in that format. I didn’t have the proper speakers to hear it in it’s full glory. And I can’t say for sure how great the separation of channels would be. And the truth is, in film work, you find that most multichannel recordings don’t sound ‘wide’ enough, so you for instance cheat another sound for the surrounds in an attempt to create that wide spacious sound you want. But hey, I love to do silly things to see if they work, and I can say that with a ridiculously elaborate ProTools session, you can indeed master four Triple-MS channels into 9.1 channels of sound. That then is a little MS primer. Post any questions in the comments below. Later when I’m home from traveling, maybe I’ll make a screen capture movie showing MS mastering in ProTools, I don’t have ProTools with me at the moment. But I hope that might give you some ideas of what you can do with MS.
Great article Tim! Thanks for sharing your knowledge . It would be great if you could write more about PT templates for MS decoding . Hey Tim. Very cool read and thanks for sharing. I too bought a Schoeps MS as my first rig and it’s still my favorite go to setup (I used it recording guns with you a few months back). I use an MK4 in the center though. Gotta pick up an MK41 capsule for it for spot fx. I’d like to hear exactly how you decode MS into LCR in PT. I’ve been doing this too, but using Waves Center post processing to derive a phantom center from a stereo file. MS can not be processed to LCR. You can not get a solution for 2 equations with 3 unknown (L,C,R). Feeding M to the center channel is no different that feeding signal from L+R by divergence to the C.
For a real LCR signal you need at least double MS.
simply because in MS the resulting R+L is the same as M.
So you could as well just put some divergence from L+R to your center. Which essentially isn´t real LCR. If you did this with an XY mic I guess you wouldn´t call it LCR either although technically it´s the same thing. I always wanted to know more about field recording and I recently had the chance of playing with a zoomh4n. It actually opened a new world for me!!! I’m wondering when i’ll get mine. as I don’t have mics that would be a good beginning, now I just think on go everywhere to record fields!! If you are able to write that article about about processing and mastering MS records. It be very pleased reading it and it would help to understand how works the omni mic in the rig!!! I’ll second Justin’s request for the follow up article explaining your pro tools MS trickery. Second question: Charles Maynes mentioned on Gear Slutz that he “LOVES” the Rode NTG-3. Do you have any opinion on this as a budget shotgun mic? Do you have any suggestions as to a good ‘budget’ first mic for general effects recording? Great article Tim- though Han’s comments regarding the use of the Mid mic along with a decoded M/S signal may not yield a “true” LCR, the potential for a much fuller screen image is very real…..
as far as using a double M/S rig to capture true LCR might present similar limitations- but as Randy Thom says- if it sounds good it IS good…. Thanks Tim – very interesting articles. One question – what is you preferred method for recording ambient/enveloping sounds like winds/birds/room tone? – Do you get better results from spaced omnis (truer low end/less wind blasting/greater impression of space) or from decoded MS (easier to record/can use same mics for FX)? Please do post re your decoding PT setup – and excuse my naivete in asking, but is the phase manipulation a concern with LtRt? I’m a fan of your work, sir! Would you suggest the NTG-3 as a first ‘good’ microphone? My current ‘mobile’ ‘rig’ is an Oktava MC012, an mbox, and a laptop. I’d like to step it up a notch. Tim (Nielson) – great article. I’ll throw in a vote to see a screen cap of your soundminer to protools LCR workflow. I’m reading this as the idea that you’d prefer a long track of a mono source or several mono sources over a fixed mic array for amb recordings. Is that correct? Any examples? My recollection of our XY – MS test concurs. It was that test that convinced me to go with my current MS rig, and I’m glad I did it. Always having a mono shotgun side available is reason enough for me. I always lamented not having that in my XY recordings. I never had any luck generating an MS from an XY to get that shotgun side, though in theory it’s supposed to be possible. Waves S1 even has a setting to do that, but it’s never given me what I needed. I ‘ve always wondered why more people don’t use M/S,especially for effects work. Zack- I dont want to distract from the thread- but please feel free to email me @ charlesbmaynes@gmail.com…..
Great article Tim! Until recently I had only recorded in XY but have been building up my mic collection (yet very modest compared to yours though!) and therefore added a Senn MKH30 mic to the collection for MS recording. I own a Senn MKH60, MKH30, a Schoeps CMC6/MK41 and have been using the Schoeps with the MKH30 for my MS work. So far I have been recording straight to stereo on my 744 but would like to look into post manipulation of the discrete MS files so would really appreciate seeing how you handle this as well as your setup for mastering to LCR files. Thanks a lot! What I actually meant was that you don´t need an MS rig to create a pseudo LCR front. Blending signal from L&R into the center-channel doesn´t make it an LCR recording. By feeding M to the center you are essentially doing the same thing as feeding L+R to the center. For this you don´t need complicated PT trickery, just use the divergence knob of the pan window. Example to illustrate: A car passing your MS rig left to right. decodes to an LR stereo recoding of a car going L to R. If you feed L+R to the center you will in fact reduce the pan-over effect because you constantly have what ever is L and R in the center. an MS mic will not decode to LCR just as AB or XY won´t make LCR. The way I take TN’s case for LCR with MS, is that if you were to go record, say traffic and literally record it LCR, you would take an XY setup and a shotgun mic, aim it at the “Scene” and record 3 discreet channels. The M side of the MS is a discreet channel. In my book this is no different (in fact way more likely phase accurate) than recording with 3 separate mics. I’m with TN on this one. I should learn my English faster, fly over the ocean and join your community as soon as possible. recording 3 different mics gives you 3 different channels of information. recording 2 and feeding a third with the content of the other 2 won´t. recording mono and putting a phase reverse signal to the left and the original to the right won´t make it a stereo recording. Very nice article there, thanks!! So by routing the M to the center you only get a stable speaker signal as compared to a phantom signal. However compared to bleeding into the middle by panning in this allows you to add C signal information without having to make-up to the level loss. BUT: Compared to a real LCR recording you don’t have the time differenc information that spaced mics have – therefor your C will only remain stable if the level is significantly higher than the amount of M in L and R (which it should be). When you move out of the sweet spot, your image will move to the side you are moving towards. Or am I wrong on this? I once mixed a documentary in 5.1 that had MS production sound. The problem was that using the LCR technique didn’t lead to a stable center image. Therefore I used EQ to tame the speech in the LR and delayed them to the C. This didn’t allow for a proper downmix so we had to do a dedicated stereo mix and you had to precisely choose what you wanted on the DVD. And a big thank you to the pros that contribute to this thread!! I really appreciate your input!! Would be great to see that template, as I’m currently doing a lot of MS decoding for a feature. Thans for the interesting article! OK I know it doesn’t seem right on the surface that MS can be LCR, but everyone stop and try this, and think about the logic. 1) Decode an MS to XY – put that on a stereo track. and leave it panned hard L & R.
2) Take the M side ONLY, of the MS. and put it on a mono track and put it up the center. This is literally the same as 3 cardiod mics arranged in an LCR array. The decoded XY is 2 channels. The undecoded M is the 3rd. Here is an example LCR of some traffic bys that was sourced with an MS file and using this procedure. You will see & heard the smooth transitions. There may be some math that tries to say this doesn’t work, but you’d be very hard pressed to get this good of a result with 3 separate mics. For my money & time, I’ll use MS.
MS is literally just a different way of mathematically expressing the same signal as XY. The two formats can be converted back and forth with no change in signal, forever. This can be very useful when trying to isolate the un-correlated part of a sound (i.e. reverb) from the correlated part (i.e. a gunshot), or vice-versa. I use this technique all the time for trying to “dry up” animal vocals before processing them. It’s also a great trick to take a complex XY signal (like a full mix of a song) and derive an MS signal for the sake of being able to process only the correlated part of the stereo image — for example, applying compression to a lead vocal or snare drum, without pumping the “air” around it. The resultant compressed Mid signal can be re-matrixed with the untouched Side signal with no degradation (providing you’re careful to not add any delay to only one channel). Many of the records we hear use this technique in their mastering phase. Speaking of phase and delay, it’s crucial that the placement of the mic’s be as close to exactly right as possible, or you will compromise the stereo image dramatically. Tim’s link to the wikirecording page shows proper diaphragm alignment. I’m a big fan of MS recording for sound effects, especially “hard fx”. (I do think that spaced omnis are hard to beat for ambiences.) Since MS and XY are inter-changable electronically / mathematically, I believe the main aesthetic differences between the two have to do with mic aiming, with the advantage going to MS because of the strong, clear mono image aimed right at the thing *you’re actually trying to record*. As Dave points out, you can indeed derive a Mid channel from a sound recorded in XY, but it rarely sounds as good as a sound captured in MS to begin with. I’m convinced this is because with XY, you’re “off-mic” with *both* mics when pointing at the thing you’re actually trying to capture! Regarding the LCR thing — I’ve heard this experiment with Tim myself (wasn’t it during our Neumann vs Schoeps shootout? ), and it is indeed very nice. Much better than just “toe-ing in” the L&R. Dave, your explanation makes sense to me, it does end up being essentially the same as having 3 mics placed very close together, right? While there will be a LOT of coincident signal between L & C, and C & R, it still sounds more natural to my tattered ears. there is absolutely no difference between using the “original” M signal or using a sum of L+R because L+R=2M or 3dB more than M.
However: What you get is simply some signal from L+R bleeded into the C channel. You will NOT get the equivalent of a third mic since there never was a third mic. It´s really very simple math and there´s no way around it. With this method something will sound from the center but it surely isn´t LCR. You are simply doubling the info contained in L+R in the channel. Yes, something is coming from the center now but it´s no additional info like in a real LCR mic setup. Hans while your math isn’t in question you’re missing I think what I’m saying. I want to write a longer post refuting some of what you are saying, but first a question. If I took an XY setup, and added a single additional mic, of the same type, aimed center, would you agree that in that case I would be recording LCR? You’d have to agree to that, right? Because in that case I would gave three discrete mic channels right? Really interesting article. Yes, it’s a bit late in the day for a reply but I have just come across it. XY does not in fact record LR because you are not recording discrete LR channels. XY records upto 180 degrees depending on the XY angle you choose -60,90,120. Therefore if you then add a centre mic and bring up the level during mix down, all you will do is reduce the width of the stereo image to mono. This is because you are not recording LR discretely but are using the main XY pair to record an angle. Your ‘phantom’ centre channel image created with the XY pair will now see more that 60degrees on either side of it pulled into the centre because of the cardioid pattern of the added centre mic. Recording discrete LCR is very different and cannot be achieved in XY + C.
It’s important to remember that ‘stereo’ recordng microphone techniques like XY, ORTF, DIN, EBS etc record angles. Exactly. This is what the undecoded M side is. No way around it. But I’ll let Tim take it from here. as Charles points out, it sounds good, so who cares about the math. don´t see any flaming. just a discussion. david: the L&R are derived from M&S. In what way is the M capsule an additional signal? Tim and David: Let me ask the other way around. What is the difference between feeding the “original” M signal to the C channel and feeding some signal from L+R to the C channel? Since M=L+R there is no difference. Ergo: You are simply feeding the sum of what´s in L and R to the center. It´s really as simple as that. I am not saying that you can not do that and you definitely get something that seems to be LCR. What some mixers do is to send L/R through a dolby matrix to create a pseudo-LCR. it´s acutally the same thing you do but the matrix decoder has a circuit built in that steers the signals to the side of the highest level. It creates a pseudo-channel separation. Without this circuit the channel separation would be zero like in your setup. Hope this clarifies it. I don´t want to generally object against what you suggest but I don´t think it´s a good idea to say that you can get 3 seperate signals from 2 mics. It´s pseudo-LCR no more but also no less. Great article Tim, thanks for sharing. And thanks to all the commenters too: lots of interesting ideas.As for the LCR debate, probably the math is right but, as already pointed out, if the decoding sounds good is good. Two questions: what do you think of shotguns (mkh60 or cmit) as M?And how do you archive/store in your library your recordings? As undecoded MS or L(C)R? Hi Tim, thanks for the post. Interesting to hear about your triple MS rig. Have you ever tried using two Fig. 8 mics with an Omni? One Fig.8 facing front/back and the other left/right. Seems to me like that would let you do all of your nine channels (and anything in between) from just three mics, if you could matrix it properly. Hi Davide, I don’t store undecoded MS sounds, for fear that they will get used without being decoded, and this can cause problems. And while I know of people using shotguns as the mid mic, and supposedly it works quite well, I haven’t yet used it. My only real experience with MS has always been using a hyper-cardiod, or short-shotgun, as the center, simply because it’s what I started with. I also tend to like more compact rigs, and my main Schoeps rig I love how small I was able to make it. Using a shotgun would necessitate at least a size 4 Rycote and right now my rig is in a size 2, and I love small it is. Hans, I certainly don’t mind this discussion either. We’re probably not going to agree on this one, and I’ll try and make my case for why I think the term LCR is totally fair for what I’m talking about. It might take a few posts. First, if you claim you cannot derive X+1, X+2, X=3 ‘channels’ of information from X number of capsules. Then surely you’re claiming that something like the Calrec Soundfield micrphone can’t possibly work too, right? It uses 4 capsules to derive a set of channels larger than 4. And it sounds amazing. But according to your math, it simply isn’t possible. In fact the whole point of MS is that you are deriving ‘channels’ from capsules which don’t even exist. You are using ‘virtual’ cardiods aimed left and right, which are created through the MS process. If you concede that a three mix XY rig is valid, then you simply must concede that what I’m talking about is sonically 100% in line with that. So whether you want to let me use the term LCR for what I’m describing, since all microphones are coincident, a three mic XY set, or an MS set, should sound almost identical. MS decoded IS XY. Once that XY pair is created, it can be considered a stand alone stereo pair. It doesn’t matter that that C could be derived from the L and R, it doesn’t change that it is a C channel, it is the plain raw microphone aimed at the center sound source. If anything, it’s the only ‘true’ channel of the MS rig, because it’s the one that hasn’t been created through clever math. The problem with your solution of divergence is most mixers tend to pan, not diverge, thereby narrowing the stereo image. What I’m talking about is specifically with that in mind. And one last question. In an XY rig, it’s known that using an MS matrix you can derive a ‘mono’ mic by reversing the MS filter right? Theoretically, this would give the sonic equivalent of a forward facing mono mic. How in theory would this be any different than using three ‘real’ capsules? In my other example, which you admit would be ‘true’ LCR, using a third capsule, in theory, would sound identical to a ‘virtual’ third capsule created from an XY pair using an MS matrix. I’m curious how you could tell me that one is ‘true’ LCR and the other isn’t, if sonically they produce the identical results? And lastly I’d say for any MS recordists out there, if you have an LCR speaker setup, just test what I’m saying. Regardless of the nomenclature, I think you’ll like what you hear, and that’s really all that matters in the end. first of all it’s not my math but Mr. Blumlein’s math who invented MS and this math is exactly what your matrix does. Second I have stated before that if you are talking MS technology you CAN get LCR or even 7.1 from double MS. It also works with the soundfield mic but that’s a or b-format. But this has nothing to do with what we’re talking about. Nothing to admit there but here goes anyway: yes you can get LCR or even 5.0 from a double MS setup or a 4 capsule tetraaeder soundfield mic because you can get many more combinations of sum and defference signal from 3 or even 4 capsules but 3 is the minimum you need for that. with plain MS there are only 1 sum and 1 difference combination you can build. but that doesn’t mean you can get LCR from MS just by putting the same signal again to the C channel. can we at least agree on the fact that L=M+S R=M-S and R+L=M? hope we can, otherwise you would be saying that MS isn’t axtually working in the first place. So if we agree on that let me please ask again (and you didn’t answer that): what is the differece between feeding the M signal to C and feeding L+R to C? also: your illustration seems like a logical idea at first. the only problem is that your virtual capsules are made from the physical M and S signals. as you can see there is no third capsule magically materializing. there is absolutely positively no difference between putting M in the center or feeding left and right to center. forgot: of course your setup sound smooth and strong and is phase coherent because your center is nothing but L+R repeated in the center channel. re: divergence vs. panning. or course I meant real divergence not panning and at least PT has real divergence AND pan on seperate knobs. let me also state: I am not questioning you method per se to create fill for the c channel. What I am critisizing is the claim that you can turn an MS mic into an LCR mic. Or diferently put: just by feeding two completely different mono signals to L and R doesn’t make it a stereo recording. rain left fire right isn’t stereo. it might sound interesting and strong but it surely isn’t stereo. your method is totally OK and might sound cool but it won’t turn your MS mic into an LCR mic whatsoever. would your MS mix become a surround mic if you fed patts of the signals to the surround channels? yes, you are playing your sound out more speakers but not a grain of information is added. First I’m +1 for MS as main recording rig. I have a miniature Schoeps with a (mechanically) switchable Cardioid/Omni as Mid. I have a second capsule like this and thus have also a compact A/B setup. As for decoding M/S. I think the most important thing is to know the theory! To understand what can go wrong and what to avoid. Once you got this: forget about it!Don’t be too academic (except you are recording a classical ensemble)! The Point about M/S is that it is very versitile as Tim already pointed out very nicely. (Thanks for the excellent article and the insight to your techniques and approach!! )The point about the centre is very valid, as the M signal just gives you more control in the mix in some way. BTW I think it is polar patterns and nonlinear frequency response off axis, that prevents decoding a comparable M signal fom XY, as well as the difference between an M center and just panning. It’s not all about math. I even go as far as to just put S -> L; M -> C; -S -> R. This works as far as it is a) not too wide. b) if any side becomes dominant the other one should be decreased. c) it is mixed with other sounds. and c) (this is where you take the risk) the speakers are not phase inverted in some way.The point to this is that you get three faders for three channels and you can get a lot of movement and life into a sound. Also for passbys I don’t need any signal in the left channel after a car passed from left to right. You can even decrease the centre or pan it as well. So all I’m trying to say is: Try anything, but know what you are doing. (Just as Charles Maynes quoted Randy Thom) – Sound effects recording and editing is not about preserving exactly the stereo image and so on from the original recording. It is about creating a plausible impression. @ Tim Nielsen: How do you handle impulsive sounds that are fairly close and in the middle of the stereo image? By mixing the decoded MS to L/R they should become pretty big on the screen. (which can be good, but not always) And which I find even more of a disadvantage, they are no pinpoint source anymore, like they would realistically be. Hans, we agree on the math for MS, I’ve never questioned that. The difference in using the M as C, or just feeding the L+R to C is only one of convenience, it allows me to work in LCR format without having to deal with divergence. Yes, you’re right, diverging L+R to C should yield the same thing, assuming you diverge equal amounts of L+R. But this is far from convenient in my book, and in my film experience, presenting an LCR track to the mix is much more convenient than the mixer constantly diverging tracks. But fair enough, it’s not a true LCR recording. I still find mastering MS into an LCR file (is that OK to say?) a very useful idea. For the reasons I outlined in the article, mainly that it also preserves the original mono recording and the stereo version for quicker and easier access (rather than having to sum the L+R back to M). And I still find the resulting LCR style file (we’ll agree on a terminology for this someday, maybe we can call it ‘Using MS as LCR material’) quite useful. I’ll give one last example of where this became quite useful as a real world example for the film I’m working on now, John Carter. David Farmer and I had recorded some hugs hogs a few years back. I recorded it in MS, and at the time I mastered it into an LCR file. This proved really useful because it gave me three possible mono tracks from which to pull the best vocals. I was able to treat that file as three mono files, and depending on the position of the various hogs in the sound field, either the L, C or R channel of the file would yield the best ‘on mic’ sound. So I’ll concede that what I’m describing is not a true LCR recording. But I’ll stick to guns when I say that recording MS can be very useful for an LCR working environment. back to the interesting stuff: I use soundminer and keep all ms recordings in ms. SM has automatic MS decoding as well as summig when you spot. so getting either xy or M only is a breeze. IMO mastering MS to pseudo-LCR is just dedundant info since you can go back and forth from ms to xy infinitely without losing anything. For me archiving straight MS is far less work than frst decoding to xy adding the sum of xy (M) to an additional track and then export everything to an LCR clip and then pull eferything apart later if needed. This is just how I deal with it. Since I always master everything in a ProTools session, re-recording through a mastering plugin chain, I like to do the MS decoding there, while mastering my recordings I’ll choose the MS settings that I want for adjusting width. And I should say, I don’t always master into LCR files, often I just master MS into stereo, it depends on the source and how useful I think it will be as an LCR type file later. Crowds and a lot of spot FX I do. Some backgrounds, like wind, or water, rain, I tend to most of the time just do stereo. But since I have a mastering / design template setup to let me make or master sounds into any format from mono to 5.1, for me it’s easy on the fly to decide to print something into Stereo or LCR, etc. Certainly to each his own. But I find I prefer to have the mastered files ready for drag and drop, even from the finder, in case I need to quickly send files to another editor for instance, no need to prep them. Yes, you have an additional rear. But from those three signals you can get 5.0.
since you have so many mics already it would be easy for you to check it out. But it´s only practical if you have a CCM8 and a CCM4 or CCM41 for the rear, otherwise it will all be too big for a basket. Must say I’ve been enjoying this discussion! Since I read the post I have played around with some of my MS recordings and have brought a few onto the dub stage and tested the suggested “LCR imaging from the MS recording” (hope I got the semantics right there :p ). I must say it does sound nice and I can see myself using this a lot from now onwards! So thanks again for sharing Tim! Isn’t that really what I’ve been saying? In the article, his center channel isn’t passing through the matrix either, so single or double MS, he’s saying basically what I was saying. yes you a correct but the article also mentions very high cross-talk and bad imaging when using conventional MS decoding plus the M capsules. As far as I understand it the cross-talk (identical signal in multiple channels) can only be optimized my using the additional rear lobe. see chapter 5b in that paper that discusses the different decoding techniques. Actually the idea of storing 3 or even 4 channels in 2 signals has been used by dolby for the last 30-40 years. but due to the poor channel separation between the front channels they used the infamous steering mechanism we all know that will duck the other channels with lower energy content. listen to a dolby surround film and turn off the center speaker. you will notice that L and R are heavily “breathin” up and down because they are steered my the dialog in the center “channel”. if they wouldn’t do this the cross talk between LCR would be too high for it to work. but let me point out again: if it sounds good it is good. i fully agree with that. Excellent Article. The Double M-S is very versatile on location especially on 788 decode! Now, they say bass is Omni but please try M-S on bass guitar in studio if doing music, doesn’t work for all but when it does, amazing! thanks for releasing some great articles. A screen capture movie of how you treat you M-S recording using the Waves plugin and without would be really benifical. I use MS instead of XY because I prefer pointing a shotgun (MKH60) at things for sfx recording, so I always mount a coincident MKH30 to give the option of MS stereo. Its convenient and works well for most things I do, apart from sounds with a lot of width like ambiences. Although some people would argue MS is not mono compatible because you completely lose the figure of 8 mic… whereas if you mount two cardioid mics in XY and sum to mono they dont cancel each other out. @Haydn – I agree with people on the M/S-mono argument, but only in the usage of terminology. It’s mono “predictable.” It’s true that XY will not cancel each other out, but you’re still going to have phase issues if you sum them. The difference with that scenario, is that you won’t know exactly how phase is going to affect a summed signal until you actually do it. Um… I will try to be concise but I never get it quite that right. I record M + S and have been doing so for 15+ years. I am a huge fan of keeping my decoder set at a universal width and I record everything the same way… I found early on that I hated post processing because I had to not only process everything but also if I was cutting things that had been processed differently they would jump around… If everything was the same, simple panning would often keep everything in the same fluid realm. I know that sounds like one in the same but really it’s not… When you are guiding pan image as opposed to correcting pan image, the mental process is for me, really different. Another thing that I love with M + S is that all my files play as stereo. They work as stereo… Now I mix in 5.1 not in stereo but I find they collapse really well… Say I need something to sit 60% center and 20% L and 20% R… no problem, I just plop it in that way… In fact, if I need something to drop all the way to mono, Pan to center and thats it, done. Yes you can divergence pan, but you can also just pan into center and off you go. I find with X – Y stereo, even ORTF (I might have messed that a bit…) There is always a bit of sonic junk or filtering that happens when I collapse to mono… Not M + S. Mash to mono and all you get is the center, nice and neat. The other and last thing I love is check out the Low Z action on a good Schoeps figure 8. HUGE… Super fun. I know someone with a slide rule can shoot a million holes in what ever I say to prove what ever they want, but experience is often subjective and my experience is that M + S when used for EFX esp. when mixing in 5.1 rules. You know one little side note is also think of what happens to all these EFX when the 5.1 gets turned into an LtRt. I have to say I also have way more luck with M + S Effects, panned into 5.1 then folded into an LtRt (obviously going back to LCRS…) then I do with L R panned into 5.1 folded into an LtRt and then back out… Just some food for thought. Awesome article, thanks so much for sharing. Hey Haydn, I disagree about how summing XY compares to MS. If you take the principle that the combined pickup pattern of any coincident rig is equal to the sum of the patterns of the component microphones, you can see that XY and MS are mathematically similar. This similarity would mean you end up losing the width of the XY the same way you would with MS when you sum to Mono. I think the real disadvantage with MS is that figure of 8 capsules are so darned hard to build to the same specs as a cardioid or Omni; they just aren’t as flat, lacking low and high end. Plus as soon as you add a M microphone with a tail, like a hyper or a shotgun, any sound that happend behind the rig is panned to the wrong side. IMHO, spaced mics just sound better, even if they are a bit of a chore to set up. JJ, agreed that figure 8’s are spec wise inferior to the mid. But in a good system like Schoeps or Sennheiser, they are close enough that it works just fine. The nature of a figure 8 means that it can’t record above about 16kHz or 17kHz, and most roll off below about 30Hz. But remember that your’e using the mid microphone as well to generate both the L and R, so the decoded stereo will still be as full range as your mid microphone. I agree spaced mics can sound great, but they aren’t ideal for spot effects, and they can have serious problems in summing. They also tend to have a ‘hole in the middle’ problem sometimes. But definitely spaced mics can sound fantastic. Very interesting arguments. And many thanks to Tim and Miguel for setting the ground for this debate. And although I feel more identified with the ‘do what sounds right’ approach, this fascinating discussion shows that despite the theory-practice dichotomy, there is a lot of passion in our area. People care a lot about what they do and that’s great. @shaun mono predictable is a good way of putting it! That’s a good point, in a mathematically/theoretically perfect ms setup i suppose loosing the S mic shouldn’t sound different to summing XY. Thanks for this great post! I want to ask you how important is it to use the same mic model and same preamp when recording m/s? Does it affect the sound or the final result? Thanks for this article Tim ! But what do you think of “all in one” MS micro, like the Shure VP88 ? There are surely not as good as the combination of 2 Seinheiser, but, if you need to be discreet with only one mic on your camera, for documentary purpose, do you think it can be good enough to record good ambiant but also nice and clear dialogue on the front ? In “half-noisy” environment, like a carnival by example ? When Blumlein developed mid/side techniques at EMI he was working with analog systems. This is a sum and difference method of deriving a stereo image. I would be interested in hearing the professional’s word on how the summing of signals in the digital domain effects the results of M/S decoding. An obscure comment by an old former boss got my head spinning on this. Anyone care to address this? Yeah old, but still good information and great response on this article. I FOUND it earlier but i keep coming back here. I don’t know if someone mentioned already, but mid side or center side with two fig. Eight mics is just a blumlein array of axis. If not processed the rear sound will always. 180 degrees out of phase and thus changing the left right posistion. Not be the poblem of the day? Please can someone explain this to me. @Tim, thanks for the really nice article. And @Hans, thanks for your comments. Hope you guys are still reading this, because I have a question about mixing MidSide recorded interviews for a 5.1 documentary. I am mixing a cinema documentary in 5.1 about an opera singer. All interviews, rehearsals and performances are recorded in MidSide, with very nice ‘ambience and room’ on the Side. @Tim, @Hans, now my question is; what do you think is a good way to mix the interviews? I assume I put the M in the Center and decode the MS to stereo an put it to Left+Right (and lower the level of Left+Right to have a good Center). But if so, am I not losing to much of the ‘ambience and room’ because I’m feeding M to the Center ánd to the Left+Right? Hope you can answer my question. Tim, thank you for such an excellent article. I hope you write the mentioned article on the post procedure on ProTools session. I’d like to take you up on that offer and would be glad if you could find the time! Thank you Tim, for this excellent article. I know it’s been up for quite a while, but the information you provide is really golden! I have been enjoying using an MKH-50, mainly for film dialogue. Beautiful mic and so glad I spent the money. I was thinking of paring it with an MKH 30 for M-S (as opposed to buying a compact stereo mic such as the AT4025). My question is how does your MKH set-up compare to your Schoeps set-up, and in what context do you use each. I was a bit worried that the 50 is hypercardioid and its effect on the kind of image you get and whether that is too directional as an all purpose stereo mic (when I need that). I can’t afford an MKH-40, so it has to be my existing 50. I guess I want to be able to use it to get some stereo ambience, perhaps at the same time as recording dialogue, but also for general foley type work. Will this combo fit the bill? My apologies if you discuss this type of thing elsewhere on your blog. Hi Terence, sorry for my late reply, I don’t get any notifications of new posts here, so I was actually surprised to still see people finding the article! My Sennheiser MS setup is just as you’re describing, a 50/30 combination. The image should be slightly more ‘defined’ with this setup over a 40/30 setup. But fear not, it works great for ambience work as well, so an MKH30 would be a great addition to your mic. As to which I prefer, or use when… I love the ‘sound’ of the Schoeps, but really either one would be interchangeable for me. We’re talking about different ‘character’ but both are fully professional setups, and the Sennheisers will prove more durable, more immune to humidity problems, etc. I often grab the Schoeps purely because I’ve mounted it in a small zeppelin, and it’s easier to carry. Other than that, both are fantastic rigs! Thus far I have primarily used the ol’ Sennheiser 416 (or similar) for almost everything. Sometimes I get a chance to record stereo location ambience, but mostly it gets created in post. I am planning to switch to MS recording so I can rely more on rich location audio. But I do rely on the 416’s ability to pick up dialogue at a bit of a distance, as the mic is usually on my camera. So I am not sure something like the CMC6XT / MK41 (+MK8) will work for me. Also not sure about mounting the dual mic on camera. I wonder about the Audio-Technica BP4029. Does anyone have experience with this MS capable all-in-one mic? The other option I see is the Sennheiser MKH418S at twice the price. Or is there any real difference between the hyper-cardioid mics discussed above and the shotguns I am more familiar with? Is it just tradition that many doc crews still rely on shotguns? Thanks for all this great info. I work primarily as a one-person doc filmmaker in wild and diverse environments. I am wanting to up my sound game. Recognizing that this is an older post, I hope some of the very experienced commenters above might still chime in. As for single mics like the Audio Technica, I have a BP4025 which is an XY mic, not MS, but it’s not a bad mic, but not the quality of a full rig. The Schoeps rig you describe, CMC6XT and MK41/MK8 is exactly my rig. Not cheap, but well worth it. A great many people I know now use that rig. Pearl also makes some nice single MS mics as well, if you want a good single mic solution, check out their mics as well. I too would like to mount two CCM Schoeps mic amps(w/MK41 & MK8 capsules) into a single MS setup for compact and on the fly recording situations. Can you recommend a pistol grip and windshield protector to complete my setup? btw, when I say ” windshield protector” i also mean a blimp. Hi Kevin, sorry for the lateness of this reply, I don’t get any notifications when someone posts on this old article, so just stumbled upon it. That Rycote is really made for mono CMC Schoeps. They do make one designed for CCM Schoeps (Stereo), and they make a stereo kit for CMC stereo MS setups as well, but the diameter of the zep is larger than this one you linked to. In the old style Rycotes, you could make the one you posted work, by switching out normal clips for MS clips. But with the new Lyre system, I don’t believe there is room to top mount a second mic in the one you posted. You could contact Rycote directly, and ask them if they have any current solution to mount an MS CMC setup in a ‘mono’ sized zep. They might have a way. The Stereo setups they sell are great, but they’re quite a bit larger in diameter than the one you posted. Thanks for the reply. I did end up getting a Rycote 080203 Stereo windshield MS kit just to be safe. It’s a little bulky as far as the width side of things but the length is perfect for what I do. I’ve heard that Deutsche Grammophone has successfully used M/S to record the Berlin Philharmonic for many years. I’m about to make my first attempt with the M/S technique to record an orchestra (in about 2 weeks), but I don’t have any sense of mic placement with respect to the orchestra or conductor. Do you have any suggestions/recommendations ? Hmm, recording music is really not my area of expertise, there might be some good web pages out there about placement. If you’re only recording with a single setup, I’d say you want to somewhat ‘closer’, I’d think maybe near where the conductor is. It is much easier to add some ‘room’ or reverb to a recording, than to try and take it away because you were too far back. Normally when recording an orchestra, quite a few mics would be used, spot mics on the instruments, a close stereo or surround setup, and a far ‘room’ mic to gather the ambience. Wish I had more advice, but I record mainly ambiences and animals and things like that! Just thought I’d experiment a little with the MS technique, after reading your excellent article, and after using the spaced-pair (with spots) technique for a while now. I use a SD 702T to record my audio. Do you use the MS encoder on the Sound Devices recorder or do you record the mid and side mics each on mono tracks and do the MS magic on music software? I also would like know if anyone uses special software to encode the MS tracks? Any suggestions on how to properly do it would be appreciated. As of now I work with two mono tracks( mid and side) and duplicate the side track pan each one hard left and right. Then I phase invert the right mono side mic track. Is there a better way to doing this? Hi Kevin, I usually record them raw, and do the decoding (or matrixing I guess is a better word) in ProTools. Waves makes a plugin, and there are some free ones out there too for VST, Audio Units, etc. The only thing to watch out for your method, is make sure in flipping the phase, you are introducing no latency on that channel. For that reason, when doing it by hand like that, I usually put a single band EQ on all channels, and flip the phase on the second figure 8. That way, if the plugin is introducing any latency, it’s doing it equally among all three channels. I just then don’t do anything on the other channel EQs. But your method would work fine, just be careful not to use more side mic than mid mic, or you’ll start to introduce phase problems into your stereo recording. That said, it’s perfectly find to just the MS matrix on the 702/722, I’ve certainly done that, and I just keep ‘width’ set to default, or right in the middle I think. Thank you for the detailed reply it was extremely helpful. .My FInal question is it posssible that if i’m recording single mono track with mkh30 & in post by duplicating that mono track & reversing the phase on original track & finally panning them hard Left & Right wiil i be getting good stereo track with mkh30 alone..
Hi DInesh, sorry I haven’t replied to the email you sent to me at the ranch, been very busy! The AT4025 is a very nice mic. I have one of those. Not a bad mic at all for general use. Adding a 30 would also work, you’ll need to find a Rycote or something to hold both mics in. No, unfortunately you cannot get stereo from just the MKh30. Well, in a way you could, it would be 180 degrees though, and as soon as you started to pan or move the image around, it wouldn’t sound very nice I don’t think. You really need a forward facing mic to go with it, to do MS properly! Thank you so much for replying Tim,what mic will you choose for ambience recording AT BP4025 xy (or) Mkh30 with mkh60 Ms kit.If you have to choose from these 2 only. Thanks for posting such an interesting article, which, with all the related comments, has made fascinating, and sometimes confusing reading. I’m a foley supervisor and sometimes recordist, and find we are increasingly using location foley in our projects. On my last shoot we had the footstep artist holding a DPA 4017 on a boom in front of her, whilst performing, as well as an MS boom and an ambient XY rig. We recorded an ton of great material which was then mixed with carefully edited studio recordings and sync sound. The mono boom was very useful but, if anything, too dry and not dissimilar to the studio recording, which rather defeated it’s purpose.. Ideally, we would use an MS rig on a boom to be held by the footstep artist, whilst performing and master it to pseudo LCR to give a bit more width and variation to the recording, as you suggest in your article. Unfortunately, MS rigs tend to be cumbersome and / or susceptible to handling noise. Do you have any thoughts on how to best approach such recording and what rig might be most suitable? Have you got any experience with single mic solutions for ease of use eg Pearl MS 8CL or the Ambient Floater to reduce handling noise. Do you have an opinion on Rycote v Cinela? I think the best solution is getting out into the field and testing as many options as I can, it’s just a case of finding the time and the kit! Sorry for the late reply, I have heard several recordists using the Audient add on, and it seems to have worked well. The new Rycote Lyre suspensions seem to work well, I haven’t ever handled a Cinela, so I’m afraid not much I could say there. The Pearl is a decent mic, but I think you’d have better luck with a Sennheiser shotgun, or Schoeps, and the add-on Audient. You’d get the benefit of the directionality of the shotgun, and still could turn it into stereo or LCR with the Audient! Thanks for getting back to me. After lots of discussion, tests and head scratching I’ve taken the plunge! I’m getting a cinela Albert LCR, XY, ORTF rig with 2 Sennheiser 8040s & an 8050 in the centre. I hope this will give me plenty of flexibility in the field. I can also take one of the mics to use as a mono on a boom., with an Ambient Floater (no longer available) to help with handling noise. I Just purchased a Sanken CMS-7S and would like to know: do I nerd to convert the recorded sound to get the m/s image or the matrix box already does that for me? I Just purchased a Sanken CMS-7S and would like to know: do I need to convert the recorded sound to get the m/s image or the matrix box already does that for me?